Collect all media, gizmos and other necessary files to make a Nuke script work, and copy it to one specific folder. Features: auto-relinking, checks for duplicates, a command-line interface, a nice user interface when run in Nuke. WrapItUp is an easy-to-use tool that can collect and relink almost all files required to make a Nuke script work on another machine. It has a user interface if you run it in Nuke, it can be executed from a command-line window for batch operations, and it can be called using a Python function. 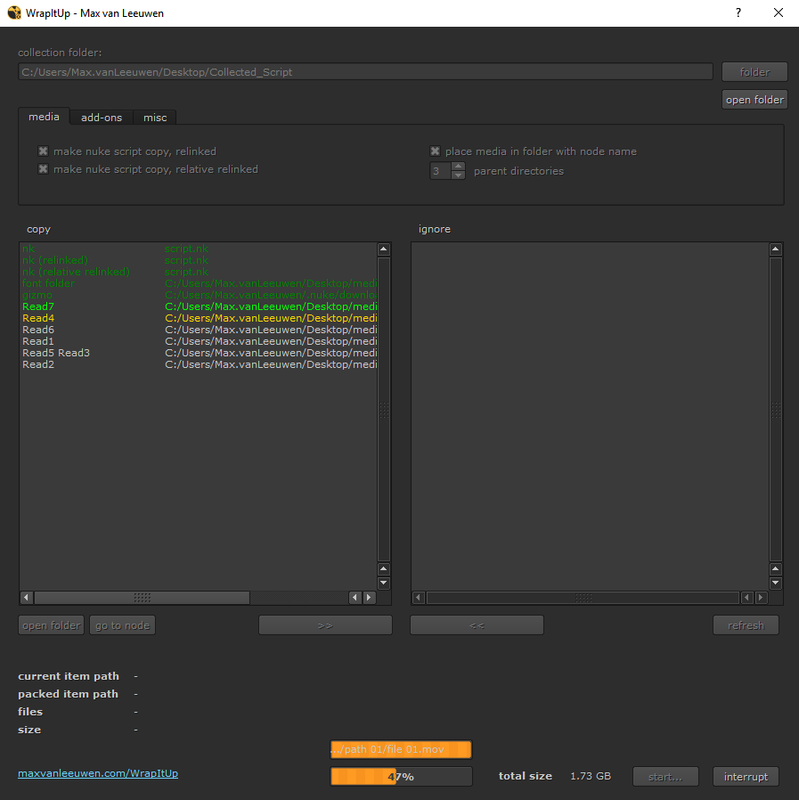 I made sure to cram the entire thing in just one Python file, so you can simply drag-and-drop the file it into Nuke's script editor if you wish to use it just once. Tested on Windows, Mac OS, and Linux (CentOS). Three copies of the Nuke script will be collected: the original, a relinked one, and a relative-relinked one (using a python-embedded TCL expression). The relative-relinked Nuke script will stay linked to its media, even if you move it to a completely different machine - as long as the media is right next to it. Media files with the path variables ####..., %**d (printf), %v and %V are supported. Gizmos will be collected, and the necessary menu.py and init.py files will be generated. Simply place these files in your .nuke folder to install them. A detailed CSV log file is generated to review which files were copied. Not supported: Shared library plugins, e.g. .dll, .dylib and .so files. There are simply too many dependencies and licenses involved to keep track of these. See my website (maxvanleeuwen.com/wrapitup) for more information about all features and settings in this script, and for command-line/Python use! Go to your .nuke folder, and create a file called 'init.py'. If such a file already exists, open it. If you are only running it once, you can simply drag-and-drop the WrapItUp/WrapItUp.py file into the script editor panel in Nuke and click 'Run the script'. Place the WrapItUp folder in the '_AutoInstaller' repository. NukeShared is a way of installing plugins by dragging/dropping them in folders, see this page for more information. If you encounter any issues (or if you have feedback/ideas), let me know (maxvanleeuwen.com/contact)! looks fantastic, looking forward to giving it a go! error "Gobal name 'QTwidgets is not define'"
Nuke 10.5 isusing the old Pyside so it's not compatible with PySide2 code. Thanks Frank, that's a really useful link! Thank you so much for this py. I'm not really sure what you mean - you can move items from the 'copy' list over to the 'ignore' list using the buttons down below them. By default, the 'ignore' list is empty (except if there are, for instance, Read nodes with missing file paths - they will be appended to that list). This is the best looking script I've seen to...well WrapItUp! Works amazingly well and the function to collect gizmos/fonts is brilliant. Thank you for all the hard work and uploading this! 1. Ask to create directory if I typed up a directory that doesn't exists in the choose folder dialog. 2. Doesn't seem to work with nodes with relative file path. Nodes with [file dirname [value root.name]] or project directory set got ignored and didn't copy. Great suggestions! I've added them to version 1.2. The TCL example you mentioned and others I regularly use are all working for me now, let me know if that's the same for you! "Yo you better wrap that gavel up B!" If the script file is named qwert.sc01.vfx0 3010.v001.nk, version 1.2 will not work. 1.1 can complete the work, but the name of the saved script will be changed to v001. I think this is the reason for the script name "." Great script. Thank you for sharing. You are absolutely correct, I have fixed this issue (and some others) in 1.3! Thanks for the info! This issue should be fixed in 1.4 now - it seemed to pop up when the project font path was empty.